Product prices and availability are accurate as of 2019-04-20 21:16:52 EDT and are subject to change. Any price and availability information displayed on http://www.amazon.com/ at the time of purchase will apply to the purchase of this product. NOTE: Used books, rentals, and purchases made outside of Pearson If purchasing or renting from companies other than Pearson, the access codes for the Enhanced Pearson eText may not be included, may be incorrect, or may be previously redeemed. Check with the seller before completing your purchase. This access code card provides access to the Enhanced Pearson eText. Sue Bredekamp, one of the foremost authorities in the field of early childhood education, is author of Effective Practices in Early Childhood Education: Building a Foundation, now in its Second Edition. At its core, this intriguing text provides the building blocks for understanding effective practices in early childhood education. 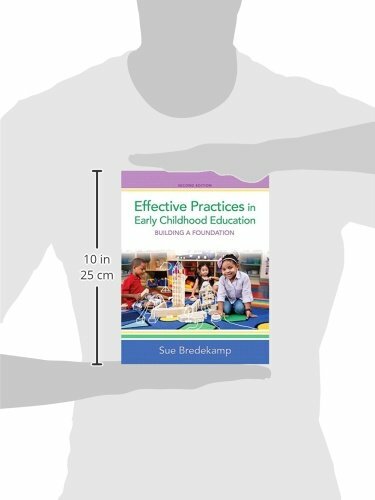 Building upon the Developmentally Appropriate Practice framework that she conceptualized, Sue Bredekamp shows how effective teaching practices can make a difference in the lives of young children. 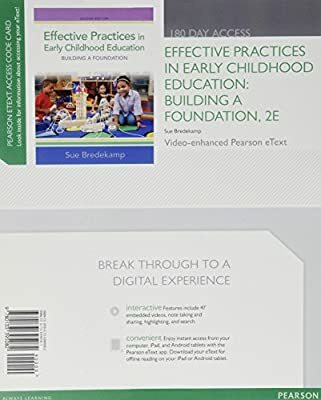 Written with a clear and engaging presentation, the author designed the book to prepare a new generation of early childhood professionals by remaining keenly focused on the three core themes threaded throughout: intentional teaching, challenging and interesting curriculum, and evidence-based, effective practices for a new generation of early childhood educators. The Enhanced Pearson eText features embedded video. Improve mastery and retention with the Enhanced Pearson eTextThis access code card provides access to the new Enhanced Pearson eText, a rich, interactive learning environment designed to improve student mastery of content. The Enhanced Pearson eText is: Engaging. The new interactive, multimedia learning features were developed by the authors and other subject-matter experts to deepen and enrich the learning experience. Convenient. Enjoy instant online access from your computer or download the Pearson eText App to read on or offline on your iPad and Android tablet. Affordable. Experience the advantages of the Enhanced Pearson eText for 40-65% less than a print bound book. * The Enhanced eText features are only available in the Pearson eText format. They are not available in third-party eTexts or downloads. *The Pearson eText App is available on Google Play and in the App Store. It requires Android OS 3.1-4, a 7” or 10” tablet, or iPad iOS 5.0 or later.